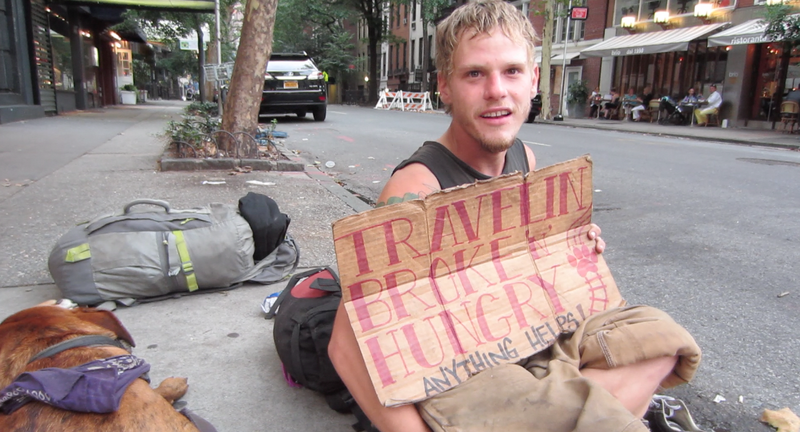 New York City – I walked past Patrick on the southwest corner of 61st St and Lexington Ave. He was grimy and had what looked like barely a shirt and khaki workman’s overalls on, but he was attracting a lot of attention from passerby. It may have been his dog or his bright smile, or maybe just his boldness. Unlike most other homeless people I have seen squatting around the city, Patrick wasn’t slouched against a building, easily ignorable to the rest of society. Instead, he had placed himself right on the corner of the intersection, just out of the way of people walking by. His sign, though on battered cardboard, was written in a neat, artistic font. Something about him caught my eye. After a few minutes of consideration, a fruitless trip to a nearby jewelry boutique, and a few more moments of agitated deliberation on the sidewalk, I decided I needed to know his story. I approached the young man crouching on the sidewalk and asked if I could interview him. He naturally asked what it was for – I told him I was thinking of starting a blog about people I met around the city. He said it would be fine if I interviewed him, but could I give him a dollar? I had already checked my wallet in my few minutes of mental back-and-forth on the sidewalk and had decided I would give him $15. He looked surprised but grateful. I turned on the camera, and began the interview. For a few minutes, I just jabbered back and forth with him. 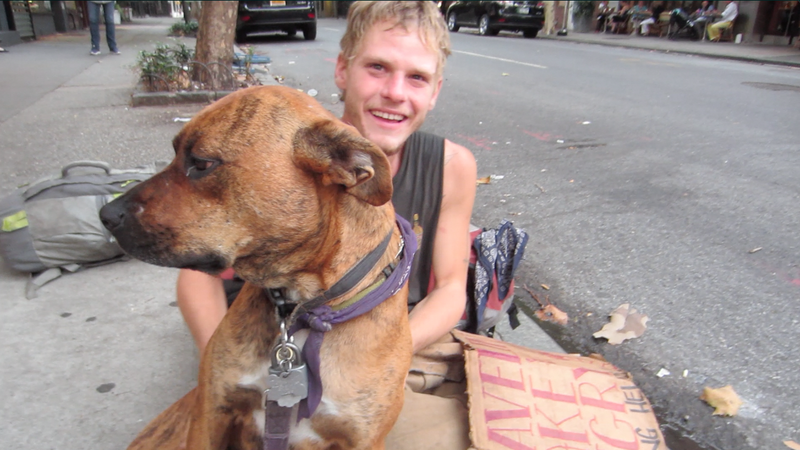 He smelled strongly of sweat, but he and his dog were friendly. I often get flustered talking to strangers. I wasn’t sure I’d be able to keep a conversation flowing. Now here was this person with whom I probably had nothing in common, who I had just approached blindly on the corner of a street. I was nervous, but, somehow, the conversation had a lilt, if not a flow. This is Molly, companion to Patrick’s friend and Patrick. Patrick’s newest tattoo. He said the “SP” was for the “Southern Pacific” train-line. I took the initials as a good omen. After the interview, I gave Patrick his promised $15. His friend had just come back and looked (humbly) surprised and appreciative. Patrick asked what the interview was all about, and if it was for an internet thing. I said yes, that I want to start a blog, and that I’ve always wanted to write. I told him I had realized I have always been interested in people and their stories. He asked if it was like journalism. I said kind of, but it was really more focused on the people themselves. I said New York is a place with so many different people, but they don’t interact – you get stuck in your own group or bubble. I said people like he and I walk past each other every day on the street but don’t interact, and I actually want to meet different people. He said, yeah, you want to know where other people come from and stuff. And I said yeah, and you never know what someone might have in common with you – like we both lived in Florida. In the end, I said bye to him and Molly and got up. As I started to walk away, a man walking next to me said “that was great”. I said thanks, surprised. I hadn’t realized we’d had an audience. He said, “really, good job”. I smiled and said thanks again and kept walking. Hopefully one day soon I’ll be less flustered by such an interaction and will be able to calmly point them towards this blog! I never gave my own name to Patrick. I was nervous about giving my own information to a stranger. And, I’m sure, my prejudice from a sheltered and privileged upbringing kept me wary when speaking to someone homeless. I sincerely hope, though, that Patrick sensed that I truly just wanted to hear his story. I wanted to meet someone coming from a different walk in life, with no judgment, just a listening ear. Thanks for reading! I checked out your photo essay – clearly we had some similar motivation!